- Exterior Wood Stove: What makes an exterior wood stove such a great addition to this facility, and to our goals of sustainability, is that we no longer need to rely on oil, we have an ample supply of this renewable fuel on our farm just 10 miles away in Ashfield, which we carefully harvest ourselves every year to support our heating needs. - Interior and exterior siding lumber was cut 10 miles away on our own land and then milled just miles away at Hall Tavern Farm. Again we have been able to make sustainable choices due to our ability to harvest trees from our own property and utilize local business to mill them and local contractors to install the finished lumber. All of our saws were built in America. The ten footer is the largest saw we have, and it allows us to cut oversized dimension slabs, an ability we did not have until the construction of our new shop. 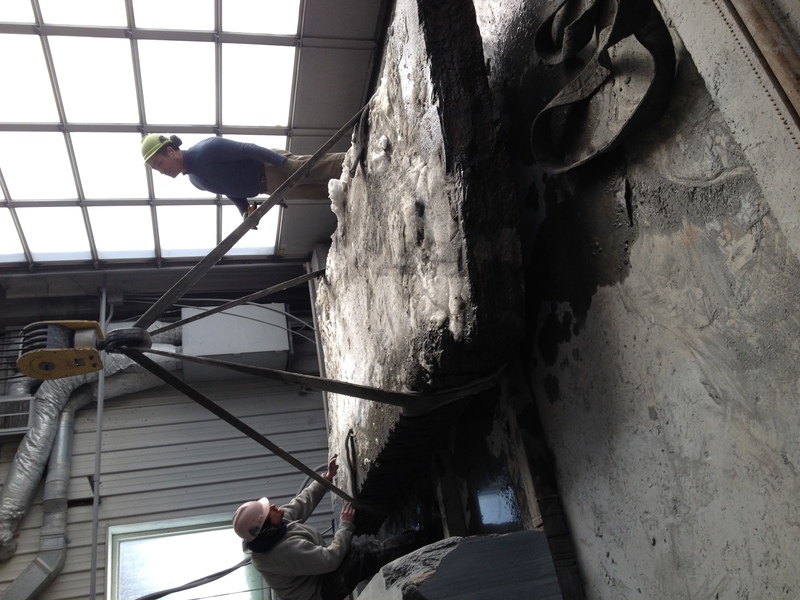 Enormous stone blocks are hoisted onto the carriage table by the 20 ton overhead gantry crane, carefully adjusted for correct alignment, and then slowly placed under the saw via the rolled steel tracks. 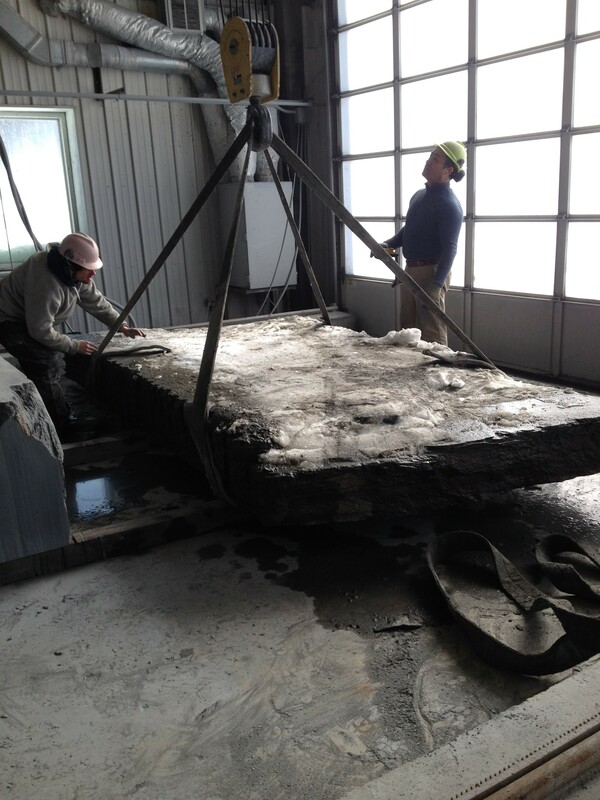 One block can take between two and four- 8 hour shifts to be completely cut into slabs. These saws are programmable to be fully automatic, and thus, they are the work horses of our operation allowing us to saw stone 24/7. Each blade has diamond studded segments soldered onto the core. Once these segments or “teeth” are worn out, we have the technician (A.K.A The Saw Dentist) from Barre Vermont come down and “re-tooth” the saw. 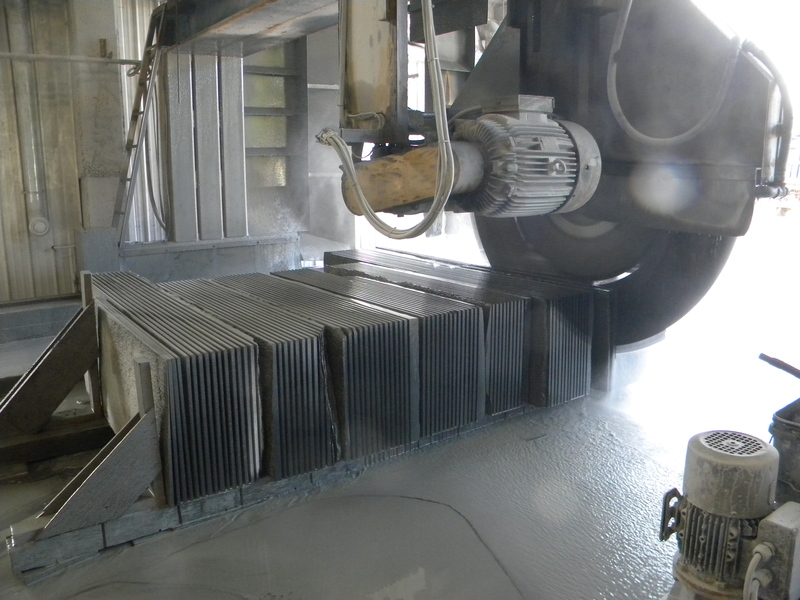 Each of the blades takes about 1/2″ of kurf and turns it to stone dust as they cut. For those of you who like ratios, that means that for every 1/2″ of slab we turn a 1/2″ into stone dust. Each saw is supplied with a constant spray of water which acts to cool the blades as they cut, as well as, collect the dust and divert it into trenches. Once the muddied water enters the trenches it is then taken into the water filtration system, stored in holding tanks, and finally run through a series of screens -at high pressures- in our filter press, which coagulates the stone dust and forms 2′ x 2′ mud cakes. Once the water is run through the Filter Press it is stored in a clean water tank and then re-circulated to our machines, thus, creating a closed loop system of recycled water. The strip saw is located at the end of our gauge/polisher as one of three machines in our linear tile/planking production line. This machine is equipped with twelve saw blades all attached to an adjustable electric motorized head. Every head of this machine can be adjusted east to west, allowing us to control the widths of our planking as we cut each piece out of our polished slab. Our Chop Saw is the smallest and simplest of our custom saws, but don’t let it deceive you, it is a highly effective tool. The Chop Saw is located at the end of our production line and is used to size each piece of planking or tile before it reaches its final resting place in one of our shipping crates. The 8 head gauging / polishing machine. Our eight head in-line gauger/polisher is the gem of our new shop. All eight heads of this machine have a spinning plate, each plate has six industrial diamond infused bricks of a certain grit, and all eight of these plates spin and move from side to side across the surface of the slab to apply the finish. 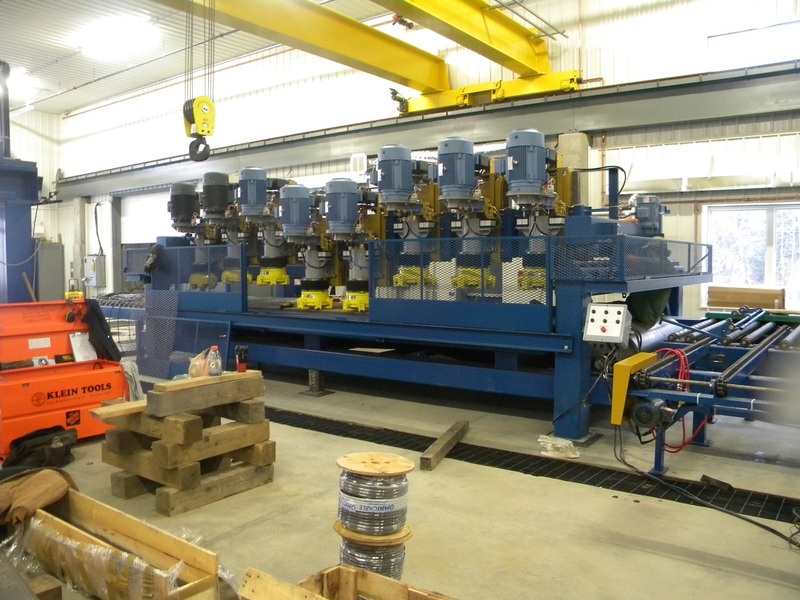 The first two heads of the machine are designated for gauging each slab before they enter the polishing process, and this allows us to maintain a uniform thickness for all of our products. The gauging and polishing of stone can be equated to an art form. Finding the right combination of speed, pressure, and diamond grit is key to the process of creating the ideal finish. Here at Ashfield Stone we have found three finishes that fit our stone’s color and character perfectly, and those are Polished, Satin, and Brushed. Our polish is unlike many other polishes in the industry. It is understated rather than the high sheen glassy appearance like that of many marbles and granites. Satin is a soft luminous, non-reflective finish that is the industry equivalent to a honed or matte finish. Finally, we provide a brushed finish. This surface has a subtle, stippled texture. Gardeners and farmers use the stone dust as a soil amendment in order to re-mineralize the soil and the diatomaceous earth filtering coating is a plus to organic growers who use it as an organic pesticide ( bugs don’t like the sharp. microscopic texture of this natural product). The stone dust can also be used as an asphalt additive which lends elasticity to the mix. We also have two bag filters on the main floor of the shop which draw the slurry directly from the floor and help supplement the filter press. Once the bags are full they can be removed, stored, and sold for the aforementioned uses. The beauty of the system is that, not only does it allow us to harvest the stone dust, it requires little water as it is a closed loop system and all the water is reused. This water filtration system is a source of great pride for our company as it is just one of many ways we try to attain a more sustainable business.